You are at:Home»Herbs»Piper nigrum Linn. Latin name : Piper nigrum Linn. Description : Its medicinal properties have been known for 4000 years. It is much employed as an anthelmintic, antioxidant, antiperiodic, antipyretic, antiseptic, aphrodisiac, aromatic stimulant in cholera, carminative, circulatory stimulant, diaphoretic, digestive, diuretic, emmenagogue, expectorant, nervine, sialagogue, weakness following fevers, vertigo, coma, etc., as a stomachic in dyspepsia, flatulence, bloating, indigestion, nausea, lack of appetite, diarrhoea and various gastrointestinal ailments. It also has antiinflammatory, bacteriostatic, fungistatic, hepatic, rubefacient and stimulant properties. It stimulates the activity of the heart and kidneys and the nervous system. It warms the body, improves circulation and prevents the proliferation of pathogens. In 2000, UK researchers found that the fruit had antibacterial properties since it was shown to effectively combat the bacteria responsible for food poisoning. It is also used in constipation, piles, colic, gastric troubles, ascites, anaemia, worms, asthma, cough, cold, etc. Also useful in malarial fever. The essential oil eases rheumatic pain and toothache. Recommended Dosage : 250 mg to 1 g powder of fully mature dried fruit. 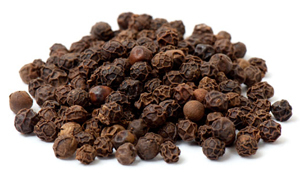 Contraindication : Black Pepper is not recommended during pregnancy or lactation. Avoid in people hypersensitive to piperine. Large amounts may elevate blood pressure.